Text messages can make us feel constantly connected to the people we care about. But texting, and the ubiquitous presence of our phones, can also have the opposite effect. Who hasn’t had the experience of sitting around a dinner table with family or friends when everyone is using his or her phone to chat with other people rather than talking face-to-face? Sherry Turkle, the Abby Rockefeller Mauzé professor of the social studies of science and technology at MIT and the winner of the 2016 Zócalo Book Prize for Reclaiming Conversation: The Power of Talk in a Digital Age, visits Zócalo to discuss this paradox, and how we can relearn the art of talking to one another. Below is an excerpt from her book. The night before at dinner he had texted a friend sitting next to him (“ ’S’up, dude?”) just to get his attention. Cameron’s objection is common, for this is the reality: When college students go to dinner, they want the company of their friends in the dining hall and they also want the freedom to go to their phones. To have both at the same time, they observe what some call the “rule of three”: When you are with a group at dinner you have to check that at least three people have their heads up from their phones before you give yourself permission to look down at your phone. So conversation proceeds—but with different people having their “heads up” at different times. Let’s say we are seven at dinner. We all have our phones. You have to make sure that at least two people are not on their phones or looking down to check something—like a movie time on Google or going on Facebook. So you need sort of a rule of two or three. So I know to keep, like, two or three in the mix so that other people can text or whatever. It’s my way of being polite. I would say that conversations, well, they’re pretty, well, fragmented. Everybody is kind of in and out. Yeah, you have to say, “Wait, what . . .” and sort of have people fill you in a bit when you drop out. The effect of the rule of three is what you might expect. As Eleanor says, conversation is fragmented. And everyone tries to keep it light. When I first planned the research that would lead to this book, my idea was to focus on our new patterns of texting and messaging. What made them compelling? Unique? But early in my study, when I met with these New Hampshire students, their response to my original question was to point me to another question that they thought was more important. “I would put it this way,” says Cameron. “There are fewer conversations—not with the people you’re texting, but with the people around you!” As he says this, we are in a circle of eight, talking together, and heads are going down to check phones. A few try not to, but it is a struggle. It was a powerful intuition. What phones do to in-person conversation is a problem. Studies show that the mere presence of a phone on the table (even a phone turned off) changes what people talk about. If we think we might be interrupted, we keep conversations light, on topics of little controversy or consequence. And conversations with phones on the landscape block empathic connection. If two people are speaking and there is a phone on a nearby desk, each feels less connected to the other than when there is no phone present. Even a silent phone disconnects us. So it is not surprising that in the past 20 years we’ve seen a 40 percent decline in the markers for empathy among college students, most of it within the past 10 years. It is a trend that researchers link to the new presence of digital communications. Why do we spend so much time messaging each other if we end up feeling less connected to each other? In the short term, online communication makes us feel more in charge of our time and self-presentation. If we text rather than talk, we can have each other in amounts we can control. And texting and email and posting let us present the self we want to be. We can edit and retouch. I call it the Goldilocks effect: We can’t get enough of each other if we can have each other at a digital distance—not too close, not too far, just right. But human relationships are rich, messy, and demanding. When we clean them up with technology, we move from conversation to the efficiencies of mere connection. I fear we forget the difference. And we forget that is a difference or that things were ever different. Studies show that when children hear less adult talk, they talk less. If we turn toward our phones and away from our children, we will start them off with a deficit of which they will be unaware. It won’t be only about how much they talk. It will be about how much they understand the people they’re talking with. Indeed, when young people say, “Our texts are fine,” they miss something important. What feels fine is that in the moment, so many of their moments are enhanced by digital reminders that they are wanted, a part of things. A day online has many of these “moments of more.” But as digital connection becomes an ever larger part of their day, they risk ending up with lives of less. Sherry Turkle is the Abby Rockefeller Mauzé professor of the social studies of science and technology at MIT and the winner of the 2016 Zócalo Book Prize for Reclaiming Conversation: The Power of Talk in a Digital Age. 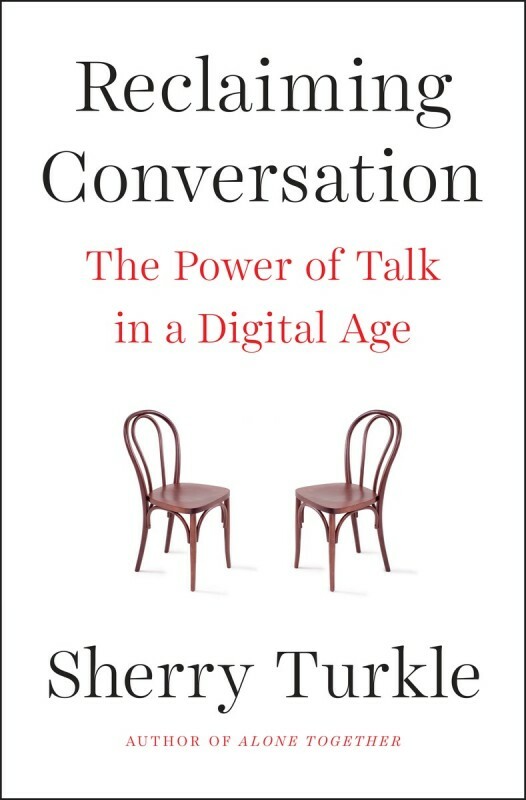 Excerpted from Reclaiming Conversation: The Power of Talk in a Digital Age by Sherry Turkle. Copyright © 2015 by Sherry Turkle. Reprinted with permission of the publisher Penguin Press, an imprint of Penguin Publishing Group, a division of Penguin Random House.